We are excited to learn that Evan has found a new home in Nebraska where he will be following his dream of working in Same Day Surgery. While we are sad to see him leave, we are extremely thankful for the time he spent with the Cadets Marching Arts. Evan, former director of the 728 Cadets Color Guard, reflects on his time with the Cadets. "Tom and Sarah told me about getting connected with the Cadets. I was always so impressed with the style and etiquette the group showed, so, when I decided to leave my previous group, I was honored to have been sought out to fill the opening. I was excited to continue the tradition and excellence that the group had." What have been some of your best times with the 728 Cadets? "The most memorable time with the Cadets was when the Winter Guard went to WGI and took 5th overall out of 130 groups. The group pushed so hard and only being their second year to Dayton, it was unexpected. There were many tears of joy and excitement that I will never forget. Other great moments include all the funny memories and laughter we had at rehearsals and on trips." What are some of your most memorable accomplishments during your time with the 728 Cadets? "I feel the best accomplishments I experienced was when I was able to see each member every season walk off the floor or street and know they couldn’t have done anything better. It wasn’t about a score--it was always about the feeling, and seeing every member experience that excitement made each season so memorable." Has anything surprised you about your role or your students during your time with the Cadets? "The biggest surprise was getting 5th in Scholastic A at WGI, as well as 2 years later competing in Scholastic Open and making Semi-Finals." "I will miss the students as well as the parents. It takes an army to make it all possible and with everyone’s support and guidance, these past 3 years have been unforgettable." "I am focusing on my nursing career. 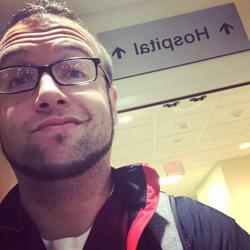 I have recently accepted a position in Same Day Surgery at a hospital in Nebraska. I look forward to this journey but am going to miss this group greatly." "Never give up. Always work hard and stay focused. Finish out every season until you graduate, because I can tell you every person who is done with the activity wished they could do more seasons. Don’t do something for the competition, do it for the feeling you feel when you accomplish something so challenging." Do you see yourself staying connected with the 728 Cadets down the road? "Yes. The next director already has been very supportive and wanting guidance about the group. I plan to come to shows, parades and other events to support this great organization. We are a family and I will never forget it!!"